A landmark court ruling in California USA is set to reignite debate among Christian communities about whether yoga is leading Christians down the path of evil, according to a report in India news site, Matters India. The Californian appeals court ruled that yoga is secular, and can be taught in schools, much to the consternation of Christian parents of a coastal beach city of Encinitas, in San Diego County,who brought the case that their kids’ yoga classes were promoting Hinduism and Buddhism. 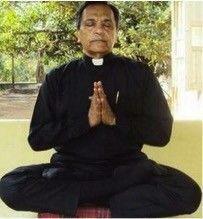 Wading into the debate, Iyengar yoga teacher and Catholic priest, Father Joe Pereira, says the furore is the work of a small group of extreme fundamentalists, whom he describes as “God addicts”. Our connected and interconnected world of mobile technology can be a distraction, but guess what? Some distractions are good for you. Instead of ‘switching off’ from technology altogether, we’ve found some apps that can help you find ways to ‘switch off’ from the busyness and distractions of life whilst staying online. Find the mindfulness and get the relaxation your body and soul need with these five apps.